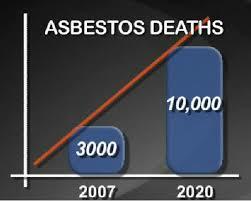 The importance of correctly assessing, removing, and working with asbestos can’t be stressed enough. Here at Trident Surveying, we offer a range of services, including the ever-vital asbestos removal project management, to ensure that your home or workplace is 100% safe. Sometimes, though, the problem is caught far too late. The majority of the time, this is because the horrific affects that asbestos can have often don’t show up until several years later, as was the case with 80-year old Joyce Hood of St Albans. Ms Hood unfortunately succumbed to mesothelioma in September. A form of lung and stomach lining cancer, mesothelioma is nearly always caused by the breathing in of asbestos fibres, and is always fatal. A testimony from Ms Hood’s son, Robert, said that she had once worked at a power station in Wales where asbestos was known to be present. He also mentioned the ceiling of the airing cupboard in the family’s home, which was made from crumbling asbestos. Joyce chose to declare that she had not been exposed to asbestos at work, following an appeal for compensation. Ms Hood’s coroner, Mr Sullivan, then recorded that Joyce had passed due to non-work related asbestos exposure. As well as inflicting horrific diseases upon those who inhale its fibres, even several decades later, asbestos can also have immediate life-altering affects. Just the other week, a mother and her son were evacuated from their home in Harlow, Essex, after asbestos was detected. A test carried out by Harlow Council revealed that extremely high levels of asbestos were present in the home of Kara Hanrahan and her eight year old son, Toby. The extent of the danger of the asbestos has meant that the family’s home has had to be entirely sealed off, with the family’s belongings, including Christmas presents, abandoned inside. Ms Hanrahan and her son are currently staying in temporary accommodation while the council carries out further tests to assess the extent to which asbestos fibres have been released. Asbestos has claimed the life of yet another person, and has ruined another two people’s Christmas. Here at Trident Surveying, we think that incidents like this should never have to occur again. It is precisely because of this that we offer a wide range of services regarding asbestos, including project management on asbestos removal, asbestos air monitoring, re-inspections and asbestos surveys. Ensure that your organisation’s workplace is safe by contacting our friendly team today about our full suite of asbestos related services. Many organisations across the United Kingdom make the mistake of neglecting proper asbestos management for their properties due to a belief that asbestos is a problem that belongs to the past. The erroneous nature of such a claim has been demonstrated once again, with the admission that close to 700 council buildings in Worcestershire are contaminated with asbestos. Worcestershire County Council has recently admitted that nearly half of its 1,500 properties contain the potentially fatal material, which can cause conditions such as mesothelioma, asbestosis and lung cancer if its fibres are breathed in. The Council admitted that properties such as schools, libraries and offices contained the deadly fibres, but said that even removal would be unsafe at this point, describing it as “not an option”. Although the true dangers of asbestos have now been known for some time, it continues to kill thousands in the UK each year due to symptoms taking between 20 and 50 years to manifest themselves. The material was commonly used as pipe insulation right up to the 1980s, and doctors warn that the number of fatalities has not yet peaked.